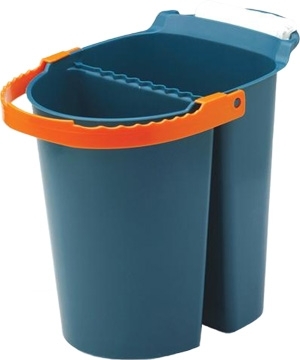 The Mijello Blue Artists Bucket is great for Studio or Field use. Large capability 10 liter (15x7.5x11.8") size. Easy Carry with colorful orange handle that also folds down to hold and protect active art brushes. Space for a fabric dabber (not included) for cleaning/dabbing brushes. Stable size that includes three unique compartments for versatile cleaning and mixing, etc….constructed of pliable propylene.